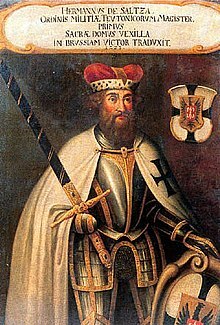 In 1211, Andrew II of Hungary accepted the services of the Teutonic Knights and granted them the district of Burzenland in Transylvania, where they would be immune to fees and duties and could enforce their own justice. Andrew had been involved in negotiations for the marriage of his daughter with the son of Hermann, Landgrave of Thuringia, whose vassals included the family of Hermann von Salza. 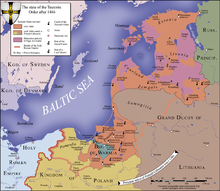 Led by a brother called Theoderich, the Order defended the South-Eastern borders of the Kingdom of Hungary against the neighbouring Cumans. Many forts of wood and mud were built for defence. 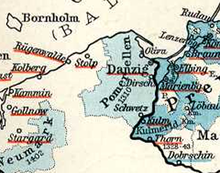 They settled new German peasants among the existing inhabitants, who were known as the Transylvanian Saxons. 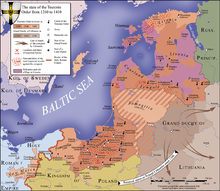 The Cumans had no fixed settlements for resistance, and soon the Teutons were expanding into their territory. 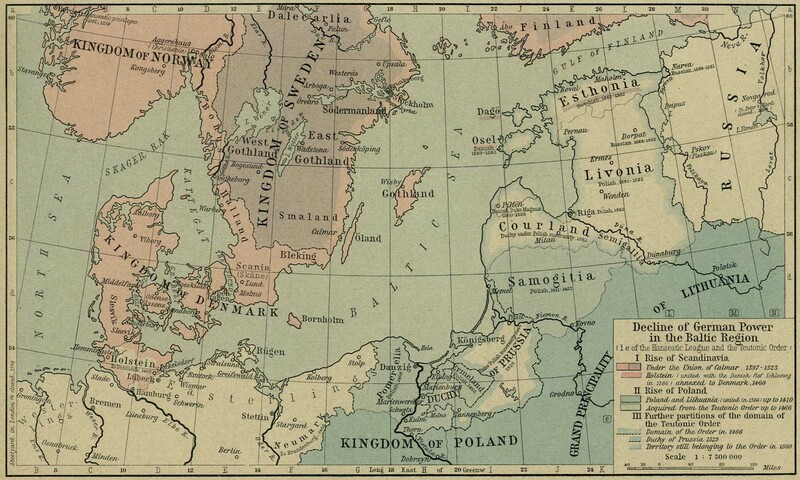 By 1220, The Teutonics Knights had built five castles, some of them made of stone. Their rapid expansion made the Hungarian nobility and clergy, who were previously uninterested in those regions, jealous and suspicious. Some nobles claimed these lands, but the Order refused to share them, ignoring the demands of the local bishop. After the Fifth Crusade, King Andrew returned to Hungary and found his Kingdom full of grudge because of the expenses and losses of the failed military campaign. 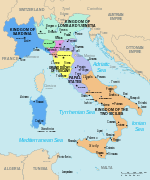 When the nobles demanded that he cancel the concessions made to the Knights, he concluded that they had exceeded their task and that the agreement should be revised, but did not revert the concessions. 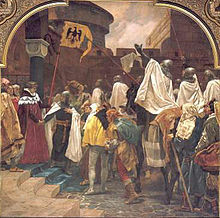 However, Prince Béla, heir to the throne, was allied with the nobility. 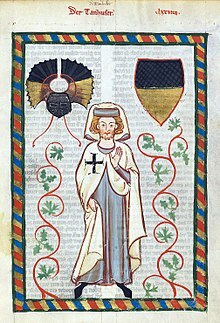 In 1224, the Teutonic Knights, seeing that they would have problems when the Prince inherited the Kingdom, petitioned Pope Honorius III to be placed directly under the authority of the Papal See, rather than that of the King of Hungary. This was a grave mistake, as King Andrew, angered and alarmed at their growing power, responded by expelling the Teutonic Knights in 1225, although he allowed the commoners and peasants (the Transylvanian Saxons) to remain. Lacking the military organization and experience of the Teutonic Knights, the Hungarians did not replace them with adequate defenses and stopped the attacks against the Cumans. Soon, the steppe warriors would be a threat again. ^ "The Order of the Teutonic Knights of St. Mary's Hospital in Jerusalem - 1190-2017". www.imperialteutonicorder.com. Retrieved 6 April 2017. ^ Sainty, Guy Stair. 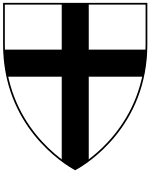 "The Teutonic Order of Holy Mary in Jerusalem". Almanach de la Cour. 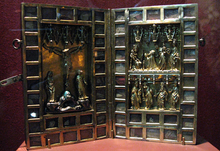 www.chivalricorders.org. Retrieved 2011-01-30. 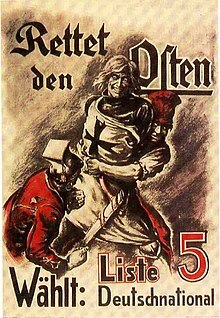 [T]he nazis...after the occupation of Austria suppressed [the Order] by an act of 6 September 1938 because they suspected it of being a bastion of pro-Habsburg legitimism. On occupying Czechoslovakia the following year, it was also suppressed in Moravia although the hospitals and houses in Yugoslavia and south Tyrol were able to continue a tenuous existence. 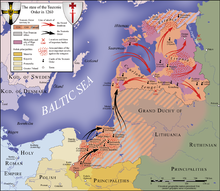 The Nazis, motivated by Himmler's fantasies of reviving a German military elite then attempted to establish their own "Teutonic Order" as the highest award of the Third Reich. The ten recipients of this included Reinhard Heydrich and several of the most notorious Nazi criminals. Needless to say, although its badge was modeled on that of the genuine Order, it had absolutely nothing in common with it. ^ a b (in Polish) Mówią wieki. "Biała leganda czarnego krzyża Archived 2008-02-27 at the Wayback Machine.". Accessed 6 June 2006.